Shovel Knight is a sweeping classic action adventure game with awesome gameplay, memorable characters, and an 8-bit retro aesthetic. It's a hot mashup of new and old! You play as the eponymous Shovel Knight, a small knight with a huge quest. Shovel Knight has come to this land with two goals: to defeat the evil Enchantress and quest for his lost beloved. He wields a Shovel Blade: a multipurpose weapon whose techniques have now been lost to the ages. Always honest and helpful, Shovel Knight is a shining example of the code of Shovelry: Slash Mercilessly and Dig Tirelessly! But, between Shovel Knight and his beloved stands a cadre of villainous knights. These terrible foes, known as The Order of No Quarter, have been dispatched to prevent Shovel Knight from reaching the Enchantress, and will pursue their mission at any cost. 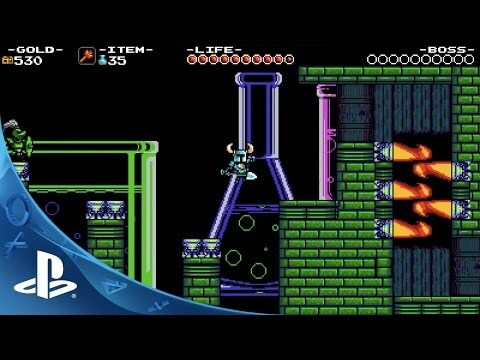 If you love games with perfect platforming, beautiful art, infectious music, crazy bosses, humor and levity, and real heart… Shovel Knight is for you!